While Eckert’s momentum didn’t continue into USA Nationals at Cedar Lake Speedway, he will surely look to revive his fortune in the upcoming Series races. The Outlaws’ first-ever visit to Georgetown Speedway will feature 40 laps and a $10,000 payday, followed by the Series’ return to Port Royal Speedway for the first time in a decade with 50 laps and $10,000 to win. Both tracks are familiar territory for the Series veteran from York, PA. Eckert claimed a victory at Port Royal Speedway with the Lucas Oil Late Model Series earlier this season. Furthermore, Eckert finished second after a last-lap pass by regional racer Dale Hollidge during a 2016 Ultimate Super Late Model Series event at Georgetown Speedway. 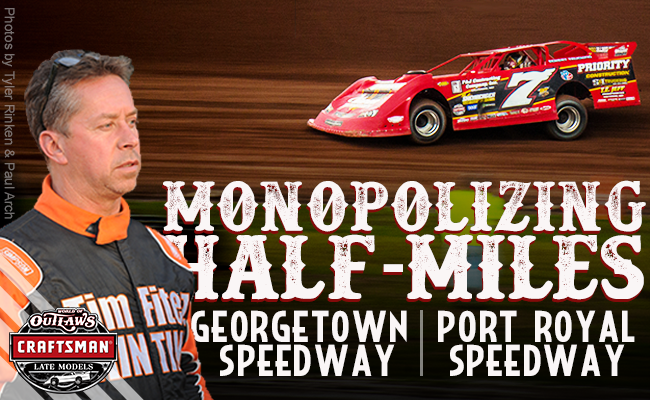 Tickets for the World of Outlaws Craftsman Late Model Series first-ever appearance at Georgetown Speedway on Aug. 17 and the Series return to Port Royal Speedway on Aug. 19 are available now. After the race at Georgetown Speedway, take your ticket stub to Sears Center at Salisbury Mall in Salisbury, MD, spend $20 on Craftsman tools and receive a free Outlaws hat while supplies last. For more information on upcoming Series events visit our website.